Building your personal brand is complicated and time-consuming. We solved that problem. I’ve been investing my own money in my personal brand for years in order to build my businesses, serve my causes, and create new opportunities like landing overseas speaking gigs or opening doors to influential people. But it was expensive to create content at scale and the idea of hiring someone else to sound like me made me cringe. Then one day I learned how Gary Vaynerchuk, a master personal brander, launched a company called VaynerTalent. My eyes popped when I read it. This was exactly what I wanted, but at $25k per month, it was way more expensive than putting the pieces together myself. I designed a process, hired a team, and invested heavily to test what worked and what didn’t. I needed to know for sure — not just take “marketing experts” on their word. When the results came in, I wanted to see if it would work for others so I shared my team with a few thought leaders I know well. And when we saw their results, I knew we nailed it. Flow helps thought leaders — people who are experts in their niche — scale their influence. The process I engineered requires less than 1 hour a week from the talent and creates over 100 pieces of custom content per month. Flow solves the problem of time. Leaders are focused and don’t have the time, interest, or know-how to create the amount of content it takes to be relevant to an audience. We do it in a way that’s affordable and optimizes the time that the talent has to put in. Flow is for emerging and established talent. Entrepreneurs, professional athletes, politicians, authors, speakers, and those with a message to share with the world. 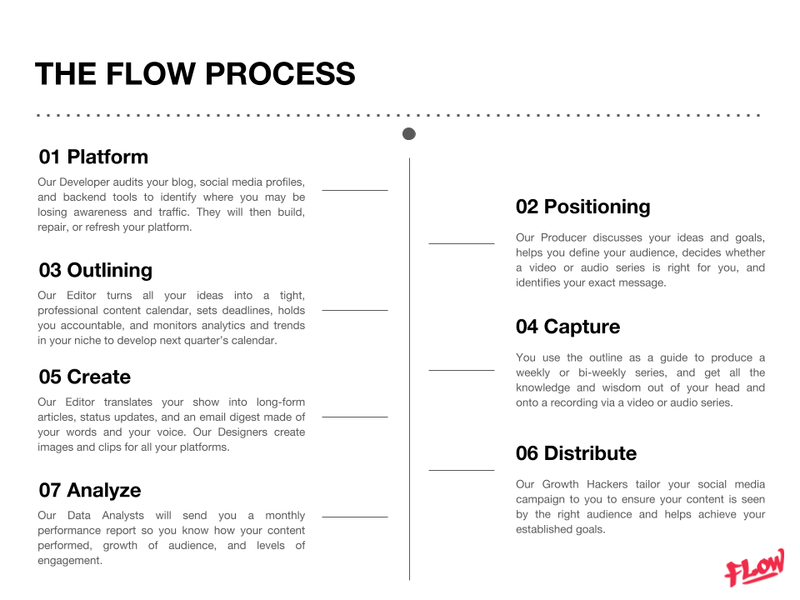 If you’re looking to develop your personal brand but struggling to create and scale your content, then Flow is for you. Whether it’s to build your business, to create a new service or product offering, start a new company, bring awareness to a social cause that you care deeply about, to transition careers, or even to create opportunities that you can’t predict now, a personal brand has so many benefits because the one common denominator is YOU. How Is This Different From PR, Social Media Agencies, And Traditional Digital Marketing? We produce talent. This means we’re getting the absolute best from clients: their brains, their personality, their expertise, their tone, their words, and their voice. We create marketing surround sound so that your audience will see and hear you everywhere. Ultimately we put a tremendous amount of competition and pressure on traditional social media companies and content marketers because we focus entirely on the personal brand. Not on the corporate brand. A personal brand can serve anything it wants: the company, its cause, future opportunities, etc. It has the most versatility and Flow understands that better than anyone. Flow’s innovative process is to interview you to produce content at scale. The process starts with building and refreshing your digital platforms. We then figure out your ideas, goals, define your audience, and decide what message is right for you. We outline everything into an editorial calendar and begin capturing your knowledge and expertise onto an audio or video recording. We take that recording to produce long-form articles and social media assets that are distributed across your digital platforms — analyzing key performance metrics weekly and optimizing for your audience. “Personal brand” is today’s term for social capital. Social capital is really the heart of what we’re helping you build. In order to have social capital, you have to be known for something, and then the question becomes: what will you be known for? How well known are you? How many people know you because of that? When you have social capital you have an emotional balance statement that you can use to open new doors, launch new products, services, businesses, or transition to the next thing. A personal brand allows you to deploy social capital based on the influence you’ve already built. You can enter a new space, a new industry, a new niche, expand, or deepen simply because of who you are, and you won’t be spending your way through it. Interested in learning more? Contact me using the form below. If you would like to continue getting information, tips, tricks, and tactics to build your personal brand, then subscribe to our newsletter and follow us on Facebook, LinkedIn, Instagram, and Twitter.